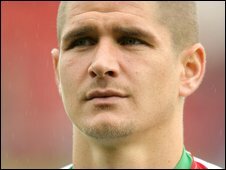 Wales midfielder Carl Robinson has announced his retirement from international football. The 32-year-old Toronto FC midfielder made his Wales debut in 1999 against Belarus and won his 52nd cap off the bench in Saturday's loss to Finland. Robinson was an unused substitute in Wednesday's 2-0 defeat to Germany. "It's not an easy decision, it's not one I've made lightly, I'm a very patriotic boy and I've enjoyed playing for my country," Robinson told the BBC. Robinson started his career as a trainee at Wolves, going on to play for the likes of Portsmouth, Sunderland and Norwich before moving across the Atlantic to Major League Soccer side Toronto in 2007. "I've travelled from the other side of the world to play for my country now for the last two years, but I just feel the time is right," added Robinson, who scored his one Wales goal against Northern Ireland. Wales manager John Toshack is in the process of overhauling the national team. That saw Arsenal's 18-year-old Aaron Ramsey make his full debut against Germany, while Wales can call on other youthful midfielders such as Joe Ledley and Jack Collison. "The direction that John wants to take the Welsh football team is the right direction with a number of good young players coming through and I just think it's time to move on," Robinson said. "If I was in this country I'd still carry on playing (for Wales)... but this is a decision purely on my life now is in North America, I want to play as long as I can over in North America with the objective of getting into management. "After chatting to my family and after chatting to John in my room on Sunday night at length, it's the right decision for me. "What I've learned over the past five or six years with John has been fantastic and I appreciate him including me in the squad." This week's home defeats to Finland and Germany ended Wales' faint hopes of qualifying for the 2010 World Cup. "We can't qualify now, I'm looking at it longer term, there's 18 months now before the next qualifying campaign starts," Robinson said. "I'm 32 years of age, it's a two-year campaign, hopefully we can qualify in that campaign which will be four years, I'll be 36 and it doesn't take a genius to work out I'll be too old."